Three Carnegie Mellon University faculty members, including the Dietrich College of Humanities and Social Sciences’ Marlene Behrmann, have received the elite distinction of University Professor. The rank of University Professor, the highest academic accolade a faculty member can achieve at Carnegie Mellon, recognizes a faculty member for representing the intellectual leadership of CMU and for their contributions to education, artistic creativity and/or research. Behrmann, who joined the CMU faculty in 1993, is the Cowan Professor of Cognitive Neuroscience and the first woman from Carnegie Mellon to be elected to the National Academy of Sciences (NAS). 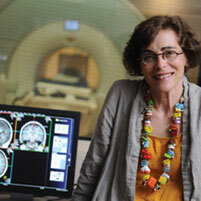 She is widely considered to be one of the foremost experts in the cognitive neuroscience of visual perception. “Marlene is a superb scientist whose career is marked by incredible creativity across a diverse range of topics, all pursued with great scientific integrity and rigor. Her appointment to University Professor is well-deserved recognition of her scientific career and contributions to the community,” said Michael J. Tarr, head of the Department of Psychology. Behrmann’s research combines behavioral investigations and brain imaging techniques with both normal and impaired individuals to identify the functional architecture of the human brain that enables our visual experiences. For example, she explores the neural mechanisms underlying how we can quickly, and seemingly effortlessly, recognize different people by their face and how we can learn to categorize and differentiate between thousands of objects. She also uses brain imaging to uncover what is happening in the brains of individuals with developmental disorders, such as autism and dyslexia. Her recent work revealed that the brains of individuals with autism display unique neural synchronization patterns, a finding that may facilitate more effective diagnosis and treatment of the disorder. In addition, Behrmann has taken one of the first steps toward deciphering the link between general brain function and the emergent behavioral patterns in autism by demonstrating that autistic adults have unreliable sensory responses to visual, auditory and somatosensory stimuli. Behrmann has received many awards for her numerous scientific contributions, including her recent NAS induction, the Presidential Early Career Award for Engineering and Science, the American Psychological Association Distinguished Scientific Career Award for Early Career Contributions and the Early Career Award in Neuropsychology. Heinz College’s Jonathan Caulkins and the College of Engineering’s Jelena Kovačević are the two other newly appointed University Professors.